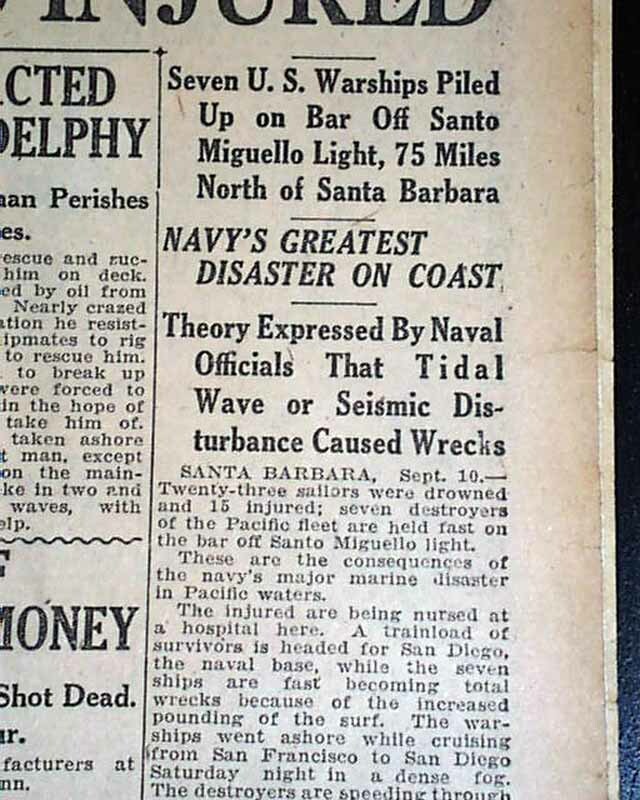 Tells of the 7 United States Navy warships running aground on the California Coast. Other news of the day. Light browning with a few small binding hioles along the spine, otherwise in good condition. wikipedia notes: The Honda Point Disaster was the largest peacetime loss of U.S. Navy ships. 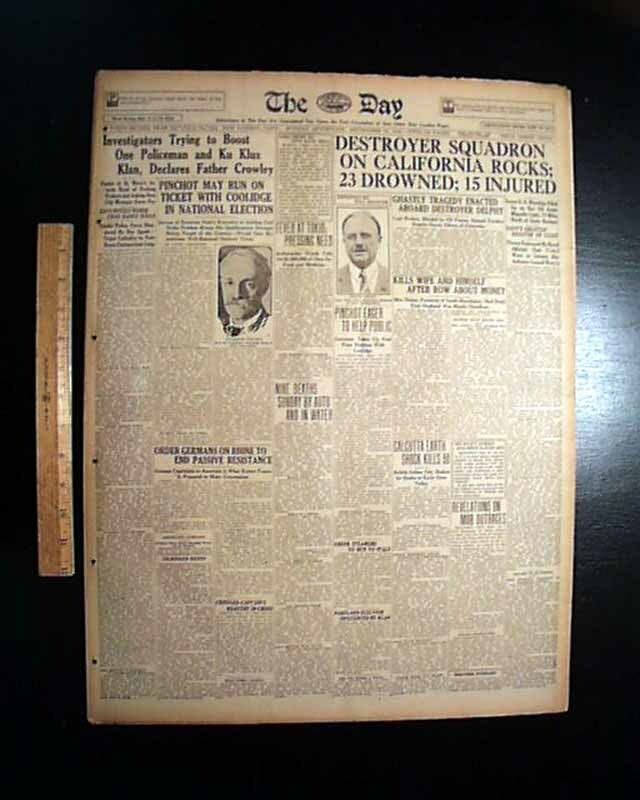 On the evening of September 8, 1923, seven destroyers, while traveling at 20 knots (37 km/h), ran aground at Honda Point, a few miles from the northern side of the Santa Barbara Channel off the California coast. Two other ships grounded, but were able to maneuver free of the rocks. 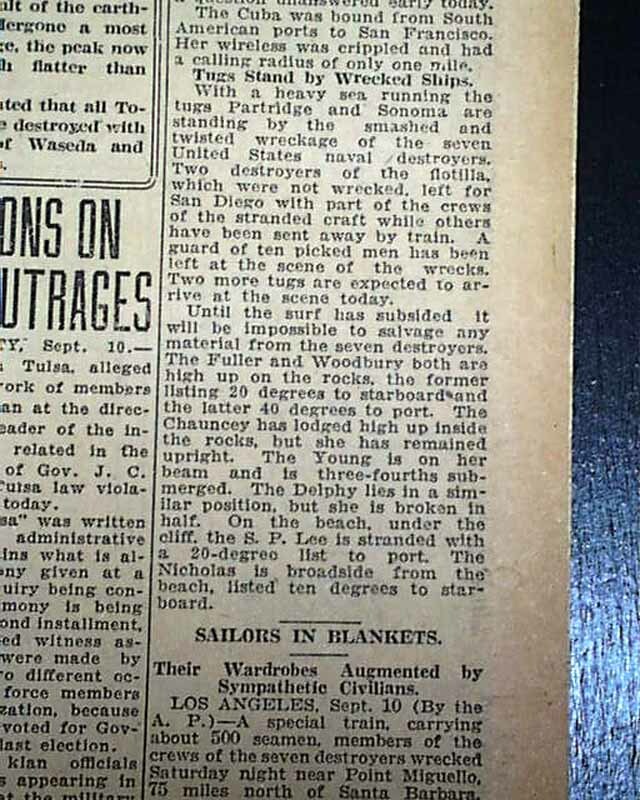 Twenty-three sailors died in the mishap. 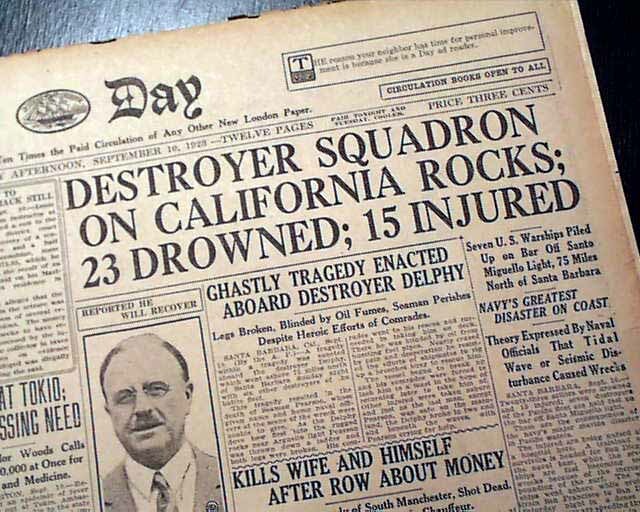 The fourteen ships of Destroyer Squadron 11 (DESRON 11) made their way south from San Francisco Bay to San Diego Bay in the late summer of 1923. The squadron was led by Commodore Edward H. Watson, on the flagship leading the squadron. All were Clemson-class destroyers, less than five years old. The ships turned east to course 095, supposedly into the Santa Barbara Channel, at 21:00. The ships were navigating by dead reckoning, estimating their position by their heading and speed, as measured by propeller turns. At the time radio navigational aids were new and not completely trusted. 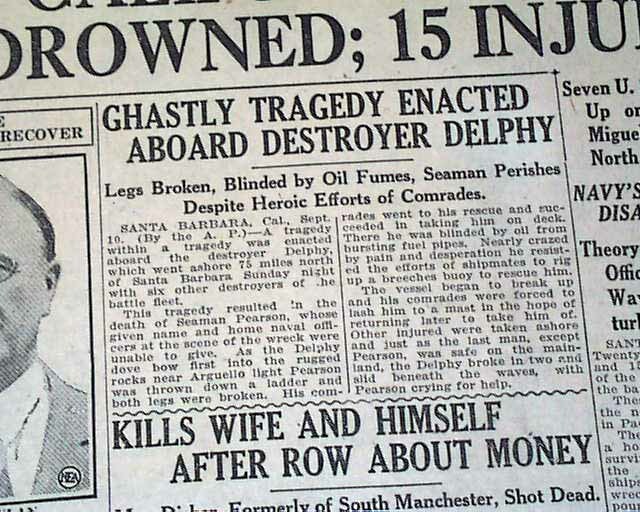 Delphy was equipped with a radio navigational receiver, but ignored the bearings, believing them to be erroneous. No effort was made to take soundings or depth measurements. These operations were not performed due to the need to slow the ships to take readings. The ships were performing an exercise that simulated wartime conditions, hence the decision not to slow down. In this case, the dead reckoning was wrong and the mistake fatal. 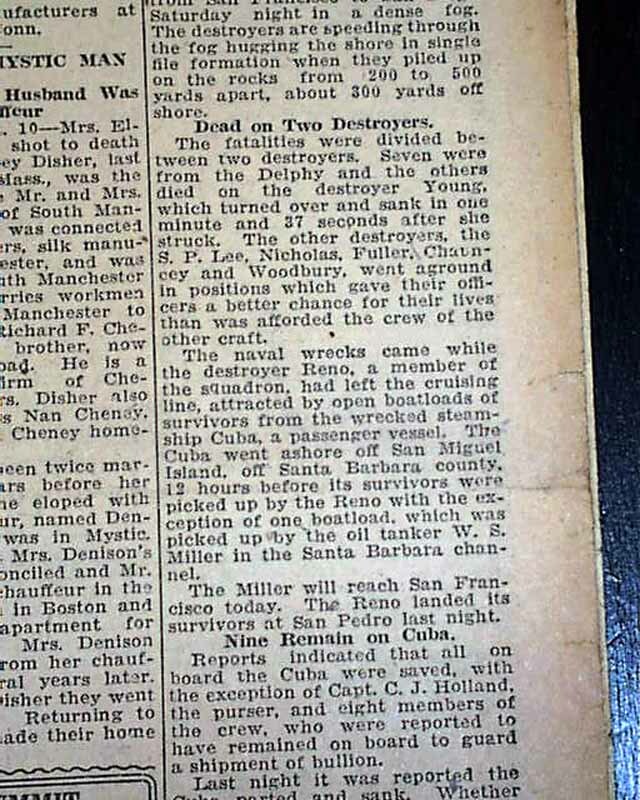 Earlier the same day, the mail steamship Cuba ran aground nearby. Some attributed these incidents in the Santa Barbara Channel to unusual currents caused by the Tokyo earthquake of the previous week.